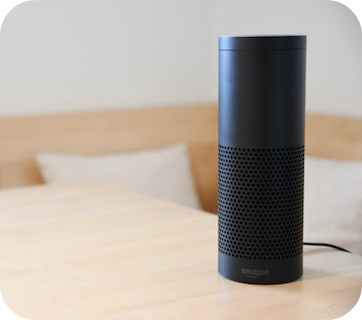 Last year consumers around the globe purchased more than 78 million smart speakers like the Amazon Echo. The e-commerce giant’s hit product is powered by Alexa, a voice-activated digital assistant that can respond to spoken commands. For example, ask Alexa what the weather is like and she will respond with the temperature as well as the chance for rain. In its marketing materials, Amazon says that Alexa “lives in the cloud and is always getting smarter.” But while many customers think that only Alexa can hear their commands, in reality a team of Amazon workers routinely listens to voice recordings captured from Echo devices. The company monitors these snippets of audio in order to improve Alexa’s voice-recognition capabilities. In one instance, an employee searched for and annotated specific mentions of Taylor Swift so that Alexa would know that these comments referred to the pop singer. Other reviewers must transcribe a user’s commands and compare them to Alexa’s automated transcription. Then there are the employees tasked with listening to everything the speaker happens to pick up, including background conversations. If the reviewer hears sensitive information such as names or bank details, they tick a dialog box that labels the clip as “critical data” and then move on to the next file. Should Amazon be more transparent about how it sometimes records and analyzes customers’ Alexa commands? Do you think Amazon’s practice of reviewing Alexa recordings will discourage consumers from buying smart speakers in the future? Source: Matt Day, Giles Turner, and Natalia Drozdiak, “Amazon Workers Are Listening to What You Tell Alexa,” Bloomberg, April 10, 2019.